Whew! I have a bit of catch-up to do! :) I wish I could say that my lack of post last night was the result of a rowdy night out on the town, but sadly I just fell asleep while watching a movie with my hubb. I'm feeling old. :) Is anybody else totally beat by Friday night? I'm happy to go out Saturday or even Sunday nights, but Fridays? Pop a movie in the dvd player and give me a bowl of popcorn and I am a happy girl. I am thrilled to say that I got a whopping 12 hours of sleep last night!!! We had the alarm set for 7am to meet the training group for a long run, but when I checked the temperature at that early hour and realized how cold it still was I made a snap decision to go for a later run (with much encouragement from my hubb!). When we finally rolled out of bed around 10am, I fixed myself a light pre-run breakfast. 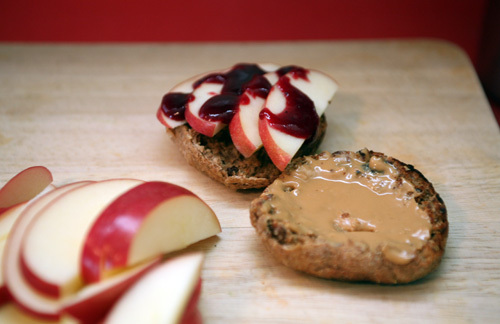 I'm going to be experimenting with some of your wonderful suggestions after last weekend's run so that I will be ready with my best fuel for the 10-miler race on April 4th. 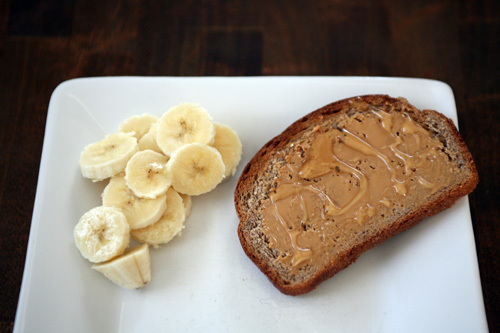 Breakfast: 1/2 sliced banana and a piece of whole wheat toast with 1 tbsp natural peanut butter and a drizzle of honey. My breakfast fuel held me over really well. No tummy growling this week. But when we got back I was ready for lunch. 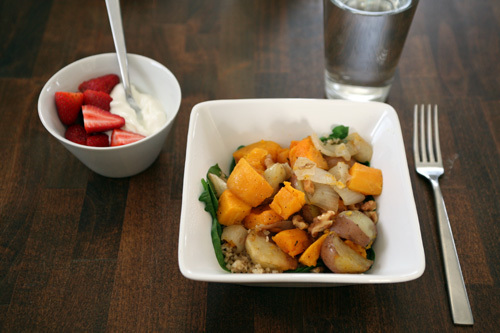 Lunch: leftover roasted potatoes + squash (recipe below...SO good) on top of leftover bulgur and fresh spinach. 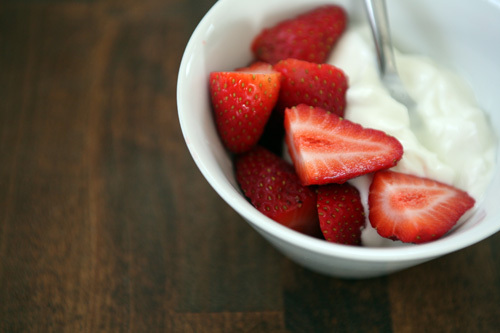 Also, a side of 1/2 cup Fage 0% and strawberries, which my hubb helped me finish. This combo was SO tasty. The spinach wilted a bit when I microwaved the bowl to heat up the squash and 'taters, making it more flavorful and the perfect consistency with the rest of the dish. So a quick recap of yesterday is in order. 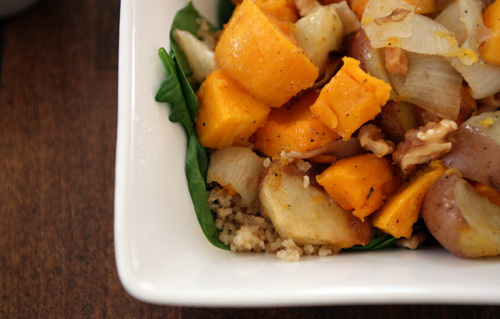 I'll try to keep it brief, but definitely hold out for the simple Roasted Squash + Potatoes at the bottom because it is a winner! Lunch: leftover stuffed acorn squash filling with roasted garlic hummus and fresh spinach wrapped up in a 8" whole wheat tortilla. 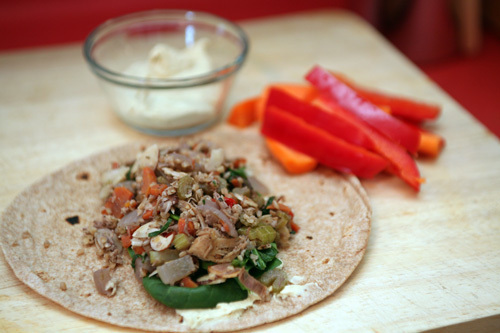 A side of extra hummus, 1/2 a red bell pepper and a carrot finished it off. It was "use up stuff in the fridge before we shop tomorrow" night, and it turned out SO well! We had leftover baked chicken breast, an acorn squash, some red potatoes that were growing eyes, and a lot of fresh produce to use up. I knew I wanted to make something with the squash and potatoes, and dreamed up this simple combo while at work. 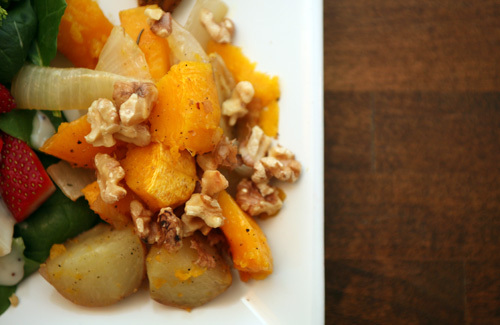 Combine everything but the walnuts in a baking dish, with the rosemary buried in the center. Roast on 375* for 45 minutes. Put walnuts on a cookie sheet, place in oven on rack underneath roasting veggies, turn oven temperature up to 400* and continue to roast for an additional 10 minutes. You may want to toss the walnuts at the 5 minute mark, just watch them so that they don't burn. 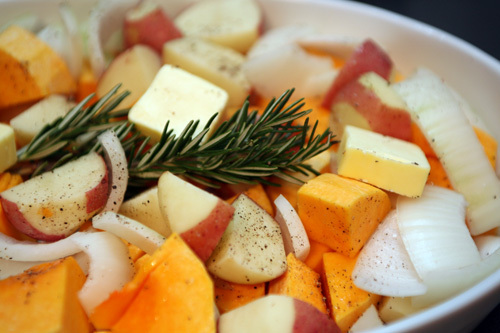 Remove rosemary and serve immediately, with walnuts sprinkled on the top. 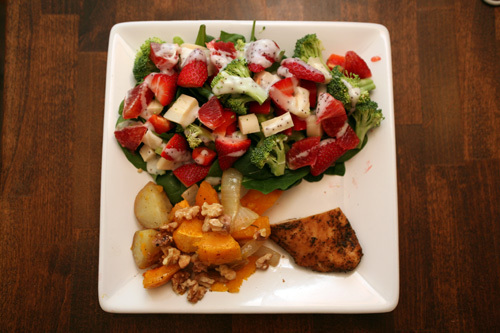 The rest of dinner consisted of a HUGE salad and 1/2 a chicken breast seasoned with Chef Paul's Poultry Magic. Allison asked me yesterday to explain the difference between a blood orange and a regular orange. Here goes! 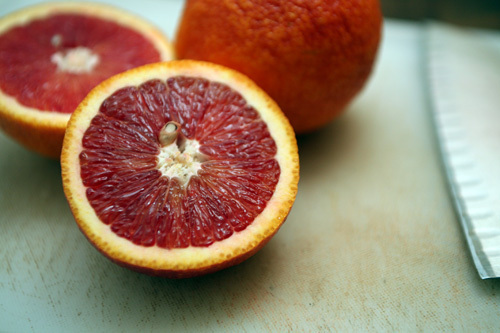 The blood orange is one of my favorite winter fruits. I look forward to it every winter similarly to how I look forward to currants at the end of fall and peaches in the summer. 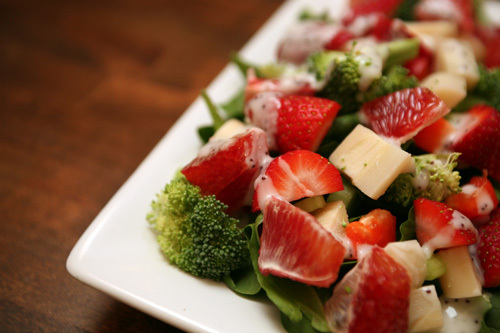 It bas beautiful crimson flesh and a distinctive taste that is somewhere between an orange and a grapefruit. It is tart, leaves a dry feeling on your tongue like the grapefruit but has a sweet finish like an orange. You see them most often made into dressings, gelato/sorbet and drinks. If you haven't tried one, go for it!!! They are just coming into season so should be hitting your grocery stores any week now. And now I'm off for some grocery shopping with my hubb. I hope you all are having a fabulous Saturday!